Click here for my previous TFW posts. I was satisfied with these figures. Revenues advanced 10%, operating profits gained 8% while the dividend was lifted 5% — and will be paid just two weeks after the results were issued. There were two promising parts to the chairman’s statement. Sugg was purchased during 1999 and has never really prospered since. 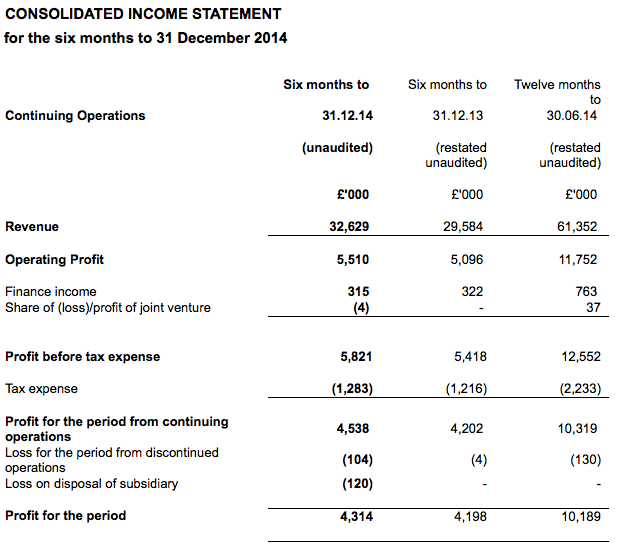 The division reported losses of £230k during calendar 2014 and I am pleased the board has finally decided to sell. 58% of first-half group revenues equates to about £19m — and dwarfs the 35% LED proportion and £10-11m of LED revenues attained during the comparable half of 2013. I am pleased Thorlux experienced good progress, with its external revenues rising 8% and profits increasing 5%. I also welcomed the performance of TFW’s ‘Other Companies’ — the aggregation of the group’s six other divisions — which managed to lift external revenues by 22% and profits by 85%. Margins at the main Thorlux division were a healthy 19%, while the balance sheet carries a substantial £41m/35p per share of net cash and investments. Cash flow appeared reasonable as well, with the chairman explaining that a new factory costing £1.4m was why capital expenditure was a significant £2m. I also see extra payments to the pension scheme reduced to just £77k during the half. Between 2010 and 2013, such payments were running at c£800k a year. 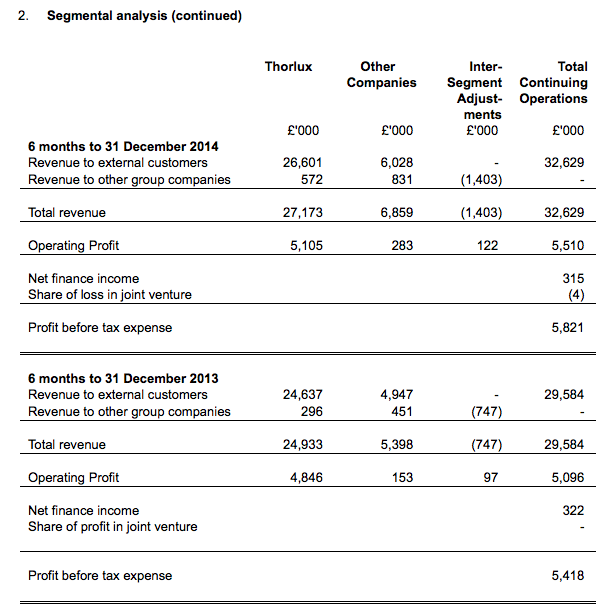 * Trailing operating profits now stand at £12.2m and, taxed at a standard 20%, would produce earnings of £9.7m or 8.4p per share. * Subtract the group’s net cash and investments from the current £174m market cap (at 150p), and I get an enterprise value of £133m or 115p per share. * Then divide that 115p by my 8.4p earnings estimate and I arrive at a P/E of 13.6. That multiple looks fair to me given Thorpe’s steady progress of late. * I said in my January TFW write-up that “I think I would add more [TFW shares to my portfolio] if the P/E multiple fell back into single digits” and that remains the case. I left this message attached to the January write up so not sure whether you’ve seen it but have to say as a former CS and now Pro member it’s good to find your blog. Great to catch up with your write ups, particularly this one, as it was one of the earlier recs I bought – and still hold. Today (last Friday) you can finally have your “party hats out and corks popping” so thanks, good luck and blog on! Yes, sorry I saw the original message, approved it, but then forgot to reply. The WordPress software I am using is quite basic, and I will have to look for a plug-in to alert visitors when their comment is approved. At the moment I have to approve each comment manually as otherwise the comments on the site will be deluged with spam. Thorpe still looking good and is a double for anyone who bought on my initial CS PRO rec, even at the top of the recommendation spike. Company still going strong — if only all my shares were like this! I knew the party hats would be used — roll on 8000! As acquisitions go, this does not look too worrying. For a start, the deal values Lightronics at £8.8m, so less than TFW’s annual profits — a rule of thumb I use to limit my exposure to shares that make large bets on acquisitions. (I have TFW spending less than £4m on acquisitions during the last ten years, so this is quite a significant purchase for the firm). I reckon the deal was done at about 9-10x earnings — probably at the top end for this sort of private-company transaction. TFW said within its 2014 annual results that it wanted to put more sales people abroad, and I see 2014 non-UK sales at sub-£8m were just a fraction higher than those recorded during 2007. Meanwhile UK sales have marched from £38m to £55m. That seems a good summary to me.